Could it be related to the soon to be announced PSNow for PC ? Edit: Seems like PSNow is being soon announced indeed, as it leaked on PSBlog. Official support for DS4 on PC? Is this real life? Maybe they'll release Windows drivers for the controller as well, so we don't have to fight with 3rd party utilities to game on a DS4. In the meanwhile, i'm perfectly happy with using DS4Windows. They also make a lot of mistakes too though. That would be awesome! I love seeing more PC games with PS button prompts. Good news for PC players, I suppose. Wait, is this just a glorified Bluetooth dongle? Dualshock 3&4 use regular ol Bluetooth. Seeing as how the DS4 uses Bluetooth, I would hope that they'd also release official drivers for that. If this was real and didn't come with drivers it'd just be an overpriced bluetooth adapter. Why a dongle/adapter? I thought the Dualshock 3 and 4 used regular ol' bluetooth? But you don't. Games can already support the DS4 natively. This won't change anything about that. pretty much. maybe it has some inbuilt xinput stuff? 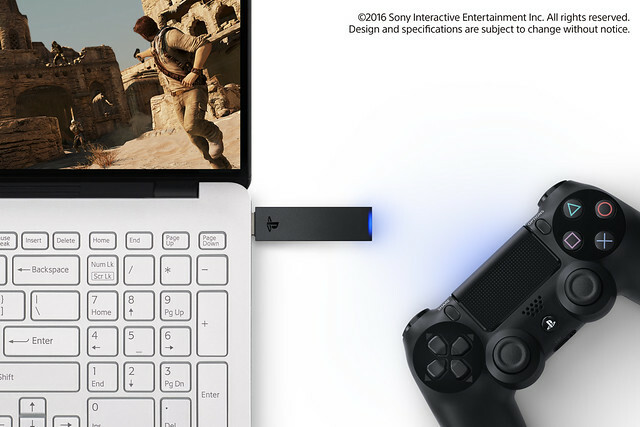 So its an official PlayStation Bluetooth dongle? Sure why not. Hopefully this means official drivers too. PlayStation Now seems like a good bet it'd be weird if this was just for remote play other games. Considering that PS Now is most likely coming to PC, they'll want it for that (and remote play). I'm highly doubting this would come with Xinput drivers. Lots of computers that have bluetooth chips are old versions of bluetooth. If it leads to official drivers they can hopefully be reverse engineered for other adapters. THIS. Give me official drivers please. No more Hide DS4 shenanigans. Arent Amazon.fr leaks BS a lot of the time? Would love proper drivers. Looking forward to seeing what comes of this. Official support would be excellent! It would make a lot of sense too as there is a remote play app on PC now and some recent PC games have offered PlayStation controller support and inputs. Every Bluetooth adapter I've tried to use for a DS4 on my PC has had really bad input lag. Like if you get more than a foot away from the adapter it's unplayable. If this fixes that, I'm all for it. Is it possible that wireless device patent is related to this? Yes please. I'm tired of being some pleb who has mentally mapped Xbox buttons to PS buttons. Why the passive aggressive tone, though? I just saw this and it's great. I just hope they allow you to use other gamepads other than the DualShock. I have one, but I use it for my PS4 and switching back and forth can be a pain in the rear. Why would it need an adapter? A driver release would do just fine. Probably the same reason they released branded bluetooth headsets for PS3 when any old bluetooth headset would work. Man, GAF must be hella slow right now. I thought new thread would have been instant. No one in the PS Meeting thread is talking about it either. It's great news but at the same time I'm still not interested in the service due to data caps and streaming quality. I don't want to be the one to do it because I'm assuming someone will beat me to the punch like always. So this dongle is going to convert xinput button prompts that are coded into every game and exist on all of MS's gamepads and all 3rd party xinput pads including the steam controller to make them the PS prompts? The reason there is no official xinput driver is because the Dual Shock family of controllers do not comply with the standard. Why would Sony release an official driver for a confusing product that won't even have the right prompts? Developers would have to have a toggle for what prompts you see like in FFXIV on PC but that is not a standard and there really isn't a big enough push for this. It works as a Direct Input gamepad just fine. If the developers of each game supported direct input as well rather than only xinput then we could get the prompts like in TW3. Unfortunately MS depreciated Direct Input and hardly anyone uses/supports it anymore plus like I said there probably isn't enough people using DS4 on PC for every PC game release to implement it. MS forced a standard and it is paying off for them. It is what they do or at least attempt with everything. I remember Luigi's Mansion/Kid Icarus/Dragon Quest X Wii U though. I wonder if there's something special about this adapter other than Bluetooth connectivity. Maybe this in conjunction with official drivers gives less input lag? Could be literally just a Sony branded BT dongle. Let's see. would be the ultimate irony if ds4 worked on windows 10 before xbox one controller, which as of now the drivers are totally screwed for wireless. I'm pretty sure 'official' drivers would be just another XInput mapper, with all the same problems InputMapper etc. have. Sony can't release proper XInput drivers.